screenshot from "The Last Clean Shirt." Frank O'Hara. An introduction to Frank O'Hara and his poetry, includes excerpts from important studies of the following poems: "A Step Away from Them," "The Day Lady Died," Why I Am Not a Painter," "A True Account of Talking to the Sun at Fire Island," "On Seeing Larry Rivers' Washington Crosses the Delaware," and more. Modern American Poetry , Cary Nelson, editor (Univ. of Illinois). Frank O'Hara. An introduction to Frank O'Hara from the Academy of American Poets , 2005. No, Mad Men Didn't Rescue Frank O'Hara from Obscurity. Blog post from Professor Andrew Epstein, 30 April 2014. Ferguson, Russell. "In Memory of My Feelings: Frank O'Hara and American Art." A visual introduction to O'Hara, excerpted from the catalog to a show on O'Hara and art at the Museum of Contemporary Art, Los Angeles in 1999. Jacket 10 (1999). Hammer, Langdon. Village People. On the memoir by O'Hara's friend, roommate and lover Joe LeSueur , Digressions on Some Poems by Frank O'Hara . From The New York Times , 13 April 2003. Remembering Frank O'Hara's Apartments. Blog post from Professor Andrew Epstein, 23 May 2014. Weaver, William. Remembering Frank O'Hara. Southwest Review 79, 1 (winter 1994) pp 139-46. 26 I Remembers of Frank O'Hara, by friend and fellow poet Kenward Elmslie, Poet's Corner web site. He Does This, He Does That. An enthusiastic introduction to O'Hara, journalistic style, by Charles Bainbridge. The Guardian 11 July 2003. Kane, Daniel. Frank O'Hara An introduction, from the Literary Encyclopedia , 17 September 2004 [subscription service]. Lehman, David. The Last Avant-Garde: The Making of the New York School of Poets (1998). The introduction to Lehman's book is reprinted in Jacket 5 (Oct. 1998) Also, a review, by Paul Hoover, from Jacket 6. Phillips, Rodney The New York School, Literary Encyclopedia , 20 December 2004 [subscription service]. Perloff, Marjorie. In Memoriam: Donald Allen (1912-2004). Professor Perloff writes about several meetings with Frank O'Hara's shy editor, Donald Allen, in Jacket 25 (Feb. 2004). Brossard, Olivier. 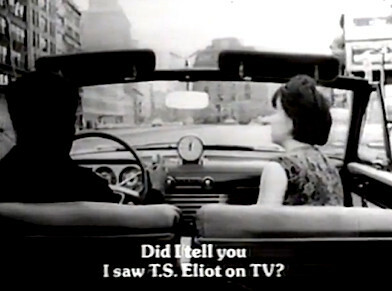 On the 1964 movie "The Last Clean Shirt" a collaboration between Alfred Leslie and Frank O'Hara, in Jacket 24 (Aug. 2003). Bergman, David, ed. Frank O'Hara (1926-1966). Suggestions for teaching O'Hara's poetry, from Heath Anthology of American Literature . Altieri, Charles. The Significance of Frank O'Hara. An older essay by a leading scholar of modernist poetry. Professor Altieri contrasts O'Hara's "Pop aesthetic" to the more traditional world views of poets like T.S. Eliot, Robert Bly, and Charles Olson. The Iowa Review 4, 1 (Winter 1973) pp 90-104 [jstor]. Burt, Stephen. Okay I'll Call You / Yes Call Me: Frank O'Hara's 'Personism.' On O'Hara's personal manifesto and the development of his style. Academy of American Poets , 2005. Hartman, Anne. Confessional Counterpublics in Frank O'Hara and Allen Ginsberg. Journal of Modern Literature 28, 4 (Summer 2005) pp 40-56 [free at jstor]. Hampson, Robert; and Will Montgomery. Frank O'Hara Now: New Essays on the New York Poet . 2010, Liverpool Univ. Press [chapter summaries at jstor]. Herring, Terrell Scott. Frank O'Hara's Open Closet. PMLA 117, 3 (May 2002) pp 414-27 [free at jstor]. Mattix, Micah. Frank O'Hara and "Why I Am Not a Painter." Notes on Contemporary Literature 40, 2 (March 2010) [questia subscription service]. Moudry, Nick. Accessibility and the New York School: New Work on Frank O'Hara and John Ashbery. Journal of Modern Literature 31, 1 (Fall 2007) pp 161-67 [free at jstor]. Perloff, Marjorie. Reading Frank O'Hara's Lunch Poems After Fifty Years. Poetry Foundation , 5 January 2015. Perloff, Marjorie. Frank O'Hara and the Aesthetics of Attention. boundary2 Vol. 4, No. 3 (Spring 1976) pp 779-806 [preview or purchase at jstor]. Perloff, Marjorie. In Favor Of One's Time (1954-61): Frank O'Hara. The American Poetry Review 6, 3 (May/June 1977) pp 6-16 [free at jstor]. Perloff, Marjorie. 'Transparent Selves': The Poetry of John Ashbery and Frank O'Hara. The Yearbook of English Studies 8 (1978) pp 171-96 [free at jstor]. Perloff, Marjorie. Introduction to Frank O'Hara: Painter Among Poets . A new (1997) introduction to Professor Perloff's groundbreaking 1977 assessment of O'Hara, in which she comments on the changed atmosphere for works about gay writers. [At Perloff's web site]. Shaw, Lytle. On Coterie: Frank O'Hara. "O'Hara's engagement with coterie generally and names specifically can be understood less as an affirmation of identity than as a meta-communal concern." Jacket 10 (Oct. 1999). Smith, Dale. A Crooked Steeple. On "Hymns of St. Bridget," a collaborative work by Bill Berkson and Frank O'Hara. Jacket 16 (2002). Yau, John. "At the Movies with Weldon Kees and Frank O'Hara." The American Poetry Review 34, 5 (Sept/Oct 2005) pp 11-17 [free at jstor]. Fifteen minutes of video of Frank O'Hara, walking with Alfred Leslie, talking to the camera, reading his poems in his apartment, smoking, a cat wandering in and out. From a film made for educational t.v. a few weeks before his death. Audio interview with Professor Edward Mendelson, who considers Frank O'Hara a skilled crafter of poetry, steeped in classical forms, and a moralist. New York Review of Books podcast, 15 Sept. 2008.